So… you have decided to take up GMAT and are aiming to score a 700+. Have you downloaded the right study materials? Made a study pattern? Analysed your strengths and weak points? Made an error pattern recognition? If you answered No to any of the questions above, then you are already running late. Quantitative abilities: The aim is to ensure that you possess the basic quantitative skills to be able to understand various concepts discussed in various courses in a business school. Verbal abilities: Business schools expect you to have a basic knowledge of English language. This helps you comprehend various text books, business cases and lectures in the class. A business programme does not leave enough time to spend on improving your verbal skills. Analytical abilities: A candidate appearing for the test needs to have decent analytical abilities since some questions cannot be answered if this quality is lacking. 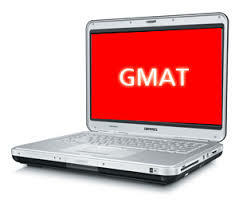 Self-study for GMAT is not difficult. It is manageable; however there are lots of things to consider and quite a few topics to cover. 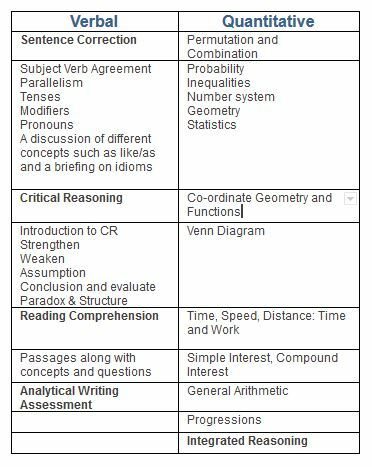 Here is a list of topics under Verbal and Quant. Proper coaching and guidance on concepts. Correct methodologies of test taking and GMAT exam structure. Even better, get it done from the experts. Let them guide you to that great GMAT score. Prepare a study schedule – preparing a schedule is as critical as the study itself, schedule provides rhythm to your studies and makes it upbeat. Balance out your study and preparations –GMAT prep analyses what you’ve prepared so far, how you are placed, whether you are good at that topic and then provides a proper roadmap. Provide mock tests – This is very important to evaluate your strong and weak points, topics of focus. Basically this helps in giving you an understanding of where you lag and where you are confident. It peps you up motivates you and even organizes you. Help you with time management – Managing time is so important that it can nullify your total efforts put in till now. Provide you exhaustive study materials and guidance. Without which there can be no proper preparations. There is nothing like having a good teacher to guide you. Get your concepts clear. Remember the ground rule; you can build castles when your foundation is strong. Get your basics right and prepare to get that glorious score. Classroom training help you in many ways than you know. They are cost effective and provide you value for your money. Classes are usually held twice a week, each class is of three hours in duration. The course covers all aspects and sections of the exams. GMAT classroom package includes a comprehensive set of study materials. You do not have to worry about downloading the wrong study materials from the internet. GMAT classroom training usually provides you with fellow GMATers to compare your mock test scores with, get influenced by their study patterns, have peer Q&A sessions, group study platforms. Anytime any doubt, you can expect someone to help you. The GMAT prep courses are exhaustive with a study plan for students, good study materials, proper coaching, mock tests, error logs and analysis etc. This methodical coaching helps students not only perform better but also get confidence in themselves. It’s an all-round growth experience. Classroom training not only helps students get an effective GMAT score but also train them for B-Schools. The journey starts here. While you are doing the GMAT then you would be sure about the coaching factors as it is really important for your gmat course to do.. Previous story How valuable will a top foreign MBA be in 30 years? How valuable will a top foreign MBA be in 30 years?